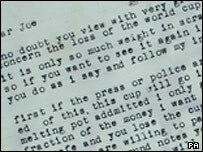 A ransom note sent after the infamous theft of the Jules Rimet Trophy shortly before the 1966 World Cup has failed to raise £15,000 - for the second time. The note - demanding £15,000 - was sent following the heist but the thief did not receive a penny after being foiled by an undercover police operation. It was auctioned on Wednesday and was expected to sell for £10,000-£15,000 but failed to meet its reserve price. The stolen trophy was found by a dog named Pickles under a hedge in London. The note, along with a range of photographs and documents related to the theft, was among nearly 1,000 lots of sporting memorabilia being auctioned by Bonhams in Chester. 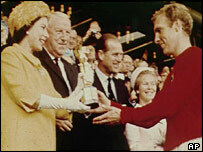 The trophy, said at the time to be worth £30,000, was stolen from a stamp exhibition in Westminster on 20 March 1966 - four months before the tournament, which was won by England. In the note, sent to FA chairman Joe Mears, who was also chairman of Chelsea at the time, the author, who calls himself Jackson, threatens to melt the cup if not given £15,000 in £1 and £5 notes. The ransom note reads: "Dear Joe Kno [sic] doubt you view with very much concern the loss of the world cup... To me it is only so much scrap gold. "If I don't hear from you by Thursday or Friday at the latest I assume it's one for the POT." 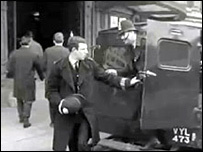 On police advice, Mr Mears, who was also chairman of Chelsea Football Club, pretended to agree to the demand. An undercover policeman met "Jackson" in Battersea Park in London, with a suitcase stuffed with newspapers, covered with a layer of £5 notes. "Jackson" - who was really 46-year-old Betchley, a former soldier - was still being questioned when Pickles found the trophy wrapped in newspaper in Norwood, south London, seven days after the theft. The infamous theft led to a replica World Cup trophy being made, which was surreptitiously swapped with the real thing during the celebrations after England's victory over West Germany in the final at Wembley. Other items in the unsold lot included various witness statements, Betchley's charge sheet, a plan of the exhibition hall and some photographs in a folder marked "Bow Street Magistrates Court", used as evidence in Betchley's trial. Several of the main players in the case met with an unfortunate or early demise. Betchley, who protested he was just a middle man and not the mastermind of the theft, died in 1969 having served two years in jail for demanding money with menaces. Pickles, whose owner David Corbett received a £3,000 reward for finding the trophy, became a canine celebrity after his heroics. He appeared on numerous television programmes, starring in a film and getting his own agent, but died a year later when he strangled himself with his lead while chasing a cat. FA chairman Mr Mears died of a heart attack within weeks of the trophy being stolen, not living to see England become world champions. The Jules Rimet Trophy itself was awarded permanently to Brazil after their third World Cup triumph in 1970 but was stolen again in Rio in 1983 and never recovered.